If you like a challenge, and a large challenge at that, then this book could be for you! 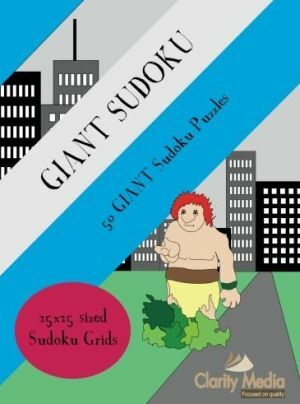 Containing 50 truly massive sudoku puzzles, at a whopping 25x25 grid size, you will need a lot of patience to solve these puzzles. However if you have that patience then the satisfaction that comes with completing these puzzles is akin to completing a jigsaw. And in a way these puzzles are jigsaws containing 625 pieces, but those pieces are the numbers that must be fitted into the grid in just the right order to 'complete the jigsaw'. For those who find normal 9x9 sudoku too easy and quick to complete, or those who just fancy a whopping challenge, then the giant sudoku in this book could be for you! Each puzzle provides many hours of fun and enjoyment and you can be sure a systematic approach will be rewarded with success, as each puzzle has a single solution that can be reached through the application of logical rule alone - you will never need to guess. The book of 25 x 25 Sudoku contains 50 brand new puzzles that all display attractive symmetry in the positioning of the givens. 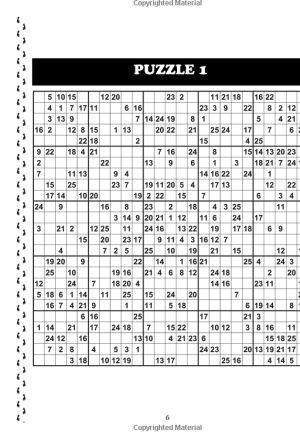 There is also one puzzle per page and a generous page size, so pencilmarks can be placed in the cells. Note that the numbers run from 1 - 25, and do not use a mix of numbers and letters which many find confusing: no letters here, just numbers! The rules are simple: place 1 - 25 once in each row, column and 5 x 5 box. In summary, if you like large sudoku puzzles and the satisfaction of taking on and conquering considerable challenges, then this book of 25x25 sudoku puzzles could be just for you and will provide many, many hours of absorbing fun and the logical challenge that comes with tackling sudoku puzzles of any shape or size. How hard are these puzzles? The main difficulty with solving these puzzles comes from the huge size of the grid and keeping track of all the options: with a total of 625 squares in each and every grid, there is a huge amount of information to keep in your mind. Therefore the actual solving rules required are the more straightforward ones: you will need to keep track of the options for each square, and where each number from 1-25 can go in each region. Therefore you won't need to worry about looking at sets of numbers, which is almost impossible when there are 25 numbers to consider in each and every region of the puzzle grid. Can I try a puzzle before buying? You certainly can - infact you can try three! Just open the link above to the sample PDF and print off. We hope you enjoy the samples and will want to buy the book itself. The book is printed on high-quality white paper, so there is good contrast with the numbers. If you want to see the size of the grids on the page, then be sure to print at 100% or to set your PDF viewer to 100% if you don't have a printer to get the most accurate idea of the size of the pages in the book. How do people have the patience to solve these puzzles? If you are asking this question, then perhaps 25 x 25 sudoku isn't the right book for you! The fact is that whilst many people can't think of anything more horrifying than solving such large sudoku puzzles, some people absolutely relish the challenge of solving giant sudoku puzzles and the satisfaction that comes from writing in the final value of the puzzle grid - and this book is very much aimed at those people. If that describes you, then we hope you enjoy this book and find it a satisfying challenge - please do let us know!